Get ready for all the First Man movie quotes, trivia, and cast info you can handle! I’m so excited about Ryan Gosling‘s new movies that I can’t stop reading about it! In case you haven’t heard, First Man is all about the first guy to step foot on the moon. It’s his story like you’ve never heard it, and a must-see for all space fans, as well as anyone who loves drama movies. Let’s check out everything you need to know about it! You’ve probably heard of the Apollo 11 lunar mission, haven’t you? Well, in case you haven’t, July 20, 1969 marked the first time in history that anyone had landed on the moon. Neil Armstrong (Mission Commander) and Buzz Aldrin (Pilot) landed the lunar module, Eagle, on the moon. Armstrong was the first person to step foot on the moon and Aldrin followed about 20 minutes later. The two astronauts spent 2 hours and 36 minutes walking on the surface of the moon. (Okay, that’s my TL;DR version). First Man is an upcoming biographical drama that is based on the 2005 official biography- First Man: The Life of Neil A. Armstrong – by James R. Hansen. The movie focuses on the years leading up to Armstrong’s famous and historical mission on the moon. First Man is set to hit movie theaters on October 12, 2018. Read on for everything you need to know about the cast, plus check out some great First Man movie quotes & trivia! One giant leap into the unknown. From Academy Award-Winning Director Damien Chazelle, #FirstMan starring Ryan Gosling and Claire Foy opens in theaters and IMAX October 12. Watch the new trailer now. Link in bio. Besides being the 1st person to walk on the moon, Neil Armstrong was also a retired astronaut, aeronautical engineer, Naval Aviator, test pilot and University professor. Armstrong died on August 25, 2012 at the age of 82, from complications from bypass surgery that he underwent on August 7, 2012. Ryan Gosling is an award-winning actor. He won a Golden Globe Award for Best Actor in a Motion Picture, Musical or Comedy, for his role as Sebastian Wilder in the 2016- La La Land . He also won a Teen Choice Award for Choice Movie: Drama Actor, for his role as Noah Calhoun in the 2004- The Notebook , one of my all-time favorite chick flicks! The stunning Claire Foy plays Janet Armstrong, who was Neil’s first wife. They were married on January 28, 1956 and divorced on April 12, 1994, after 38 years of marriage. Janet and Neil had 3 children together- Eric, born in 1957; Karen, born in 1959 and Mark, born in 1963. Tragically, Karen died in 1962, at the age of 2, from pneumonia, resulting from her weakened body, caused by a brain tumor. Claire Foy has won 3 awards for her portrayal of Queen Elizabeth in the Netflix historical drama television series- The Crown, including the 2017 Golden Globe Award for Best Actress- Television Series Drama, as well as the 2017 and 2018 Screen Actors Guild Award for Outstanding Performance by a Female Actor in a Drama Series. Foy did such a great job in this movie that Neil Armstrong’s son praised her portrayal of his mother. Deke Slayton was an astronaut, aeronautical engineer, test pilot and WWII pilot. He was selected, by NASA, as one of the Mercury Seven astronauts in 1959 and he became NASA’s 1st Chief of the Astronaut Office in 1962, providing him the decision to choose the astronauts of the Apollo Program. Kyle Chandler won the 2011 Primetime Emmy Award for Outstanding Lead Actor in a Drama Series, for his role as Coach Eric Taylor in the television series- Friday Night Lights. Buzz Aldrin is a retired astronaut and United States Air Force Command Pilot. He was alongside Armstrong in the Apollo mission, making him the 2nd person to walk on the moon. Corey Stoll is probably best known for his role as Darren Cross/Yellowjacket in the 2015- Ant-Man. He was also Prosecutor Fred Wyshak in the 2015- Black Mass and as Dr. Ephraim Goodweather in the television series- The Strain. David Scott is a retired astronaut, aeronautical engineer, test pilot and United States Air Force Officer. In 1966, Scott and Armstrong flew together on the Gemini 8 mission. In 1971, Scott became the 7th person to walk on the moon, as Commander of the Apollo 15 mission. Christopher Abbott is probably best known for his roles as James White in the 2015- James White and as Mason Tannetti in the television series- The Sinner . Elliott See was an astronaut, aeronautical engineer, Naval Aviator and test pilot. See was part of the backup crew, along with Armstrong, for the Gemini 5 mission in 1965. In 1966, See and Armstrong also flew together for the Gemini 8 mission. He was tragically killed on February 28, 1966, while he was training for the Gemini 9 mission. Patrick Fugit is well known for his roles as William Miller in the 2000- Almost Famous , as Patrick Wheeler in the 2004- Saved and as Officer James Gilpin in the 2014- Gone Girl . Michael Collins is a retired astronaut and test pilot. He is also the former Assistant Secretary of State for Public Affairs, as well as the former Director of the National Air and Space Museum. Collins was the Command Module Pilot for the Apollo 11 mission. Lukas Haas has appeared in over 50 movies and television shows, most notably starring as Samuel Lapp in the 1985- Witness, as Mikey Talbot in the 1989- Music Box and as Ryan White in the 1989 television movie- The Ryan White Story . Quotes from the 1st movie trailer, released on June 8, 2018 by Universal Pictures. To date, the trailer has received 7,505,338 views. From Academy Award-winning director Damien Chazelle, #FirstMan starring Ryan Gosling is coming soon to theaters and IMAX. Watch the full trailer now. Link in bio. Quotes from the 2nd movie trailer, released on August 29, 2018 by Universal Pictures. To date, just 2 days after its release, the trailer has received 1,945,422 views. 49 years ago today #Apollo11 landed on the Moon. #FirstMan will share the story. Visit @NASA at www.nasa.gov/moon to learn more about this impossible journey. Damien Chazelle is First Man’s director. He has won both an Academy Award and a Golden Globe Award for Best Director for the 2016- La La Land (trailer above), which also stars Ryan Gosling in the movie’s lead role. First Man has already gotten off to a great start, even before being released in movie theaters, according to the two top review aggregators. Metacritic gave the movie a score of 81 out of 100, while Rotten Tomatoes gave the movie an approval rating of 89%, with an average rating of 8.4 out of 10. Before Universal Pictures bought the film rights to the 2005 biography- First Man: The Life of Neil A. Armstrong- by James R. Hansen, Clint Eastwood and Warner Bros owned the film rights. Based on an award-winning biography! And speaking of James R. Hansen, did you know that he received an award for penning the 2005 authorized biography? He was awarded the American Astronautical Society’s Prize for Astronautical Literature. Jon Bernthal was originally cast for the role of David Scott. However, Bernthal had to leave the role due to a family emergency and was replaced by Christopher Abbott. (All you fans of The Walking Dead will remember Bernthal as Shane Walsh in Seasons 1 and 2). If you love historical movies, space travel, or even just a good drama, I think you’re definitely going to want to see First Man on October 12th! I know I’ll be grabbing my tickets on Fandango before hitting the theater as soon as it comes out! 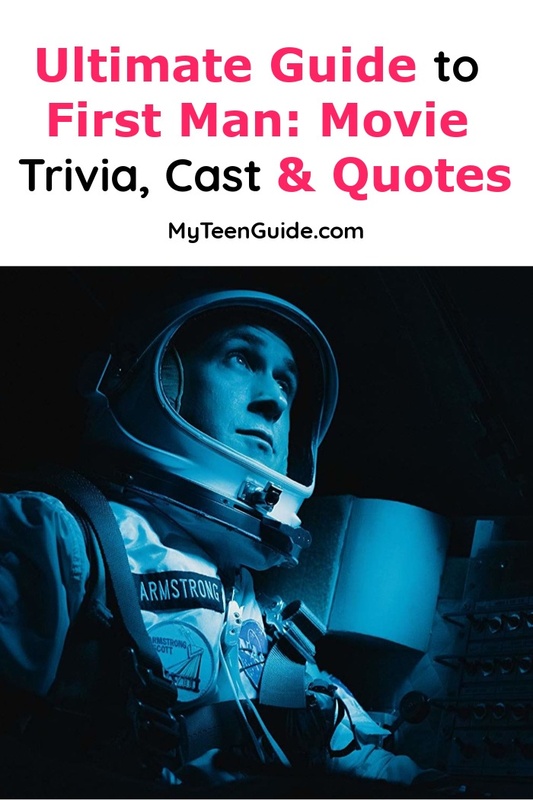 Have you heard any other great First Man movie quotes or trivia? Which cast member do you love the most? Share below!